How did C-3PO get his red arm?! If you watched Star Wars: The Force Awakens I’m sure that’s a question you had on your mind after seeing C-3PO (and then he gets his classic arm back at the end, another story). 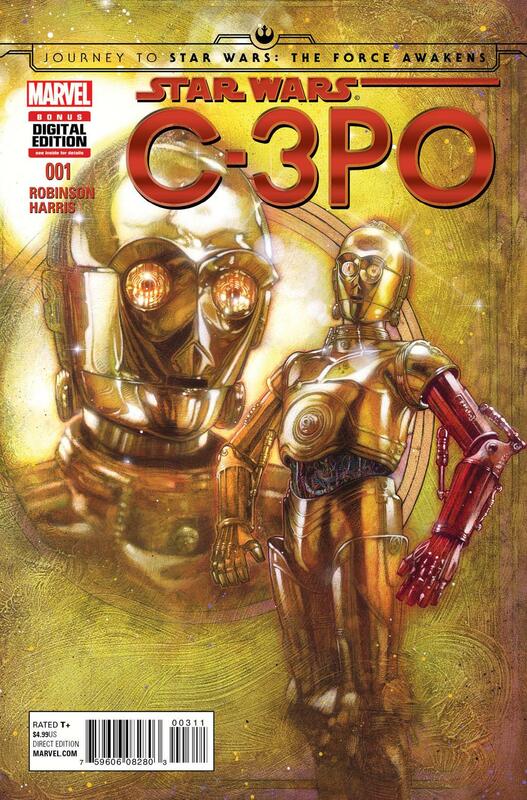 In Star Wars Special: C-3PO #1, we get the story behind the red arm and the answer is just… ok. The comic is not bad at all, it’s just not very fulfilling in many ways. The story is a one-shot, so get this and you’re done, and it definitely answers the question on how C-3PO got the arm. It’s just the comic doesn’t have much heft to it, and compared to the rest of Marvel’s Star Wars comic output, it is far short in quality. Writer James Robinson does have some interesting nuggets here when it comes to the various droids involved in the story, there’s some fun moments and it adds a little bit to droids in the Star Wars Universe. The art by Tony Harris is generally lacking with a style that doesn’t quite work. As an indie story it’d work, even a non-cannon fun short it’d work, but for this story something doesn’t click for me. Not sure exactly why that is, but there’s something just missing when it comes to the art. Possibly the action, the dread, the style doesn’t quite fit the tone. The comic would have worked much better as a series of shorts in the back of some other issues, but on its own, it doesn’t quite work. There’s unfortunately not much there to really justify the comic or make it exciting. Marvel has been full of hits when it comes to their various Star Wars comics, but this one is definitely a miss.